Regina Beswick is all about restoring old cars. But when Tanner Burkhardt asks her to restore an old nation, she must decide which destiny to follow. Regina Beswick never dreamed of faraway places. She is happy with her life as a classic car mechanic and owner of a local restoration shop. But the fairytale book, drawn by her great-grandma, makes her wonder if she's destined for greatness. Tanner Burhardt, Minister of Culture for Hossenberg, believes Miss Beswick is the least likely candidate to be his country's long-lost princess. It's up to him to transform the strong-willed Southern girl into a reigning royal if he wants to save his nation. As Regina and Tanner return to Hessenberg to fulfill their destinies, Regina quickly learns that someone playing princess isn't what's needed. This is a full-time role for a nation on the brink of financial destruction. Unprepared for the responsibilities of running a country, Regina must look deep into herself and trust God if she is to fulfill her true destiny. 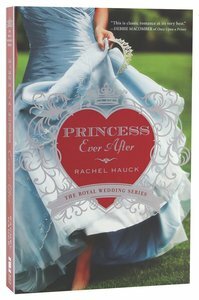 About "Princess Ever After (#02 in The Royal Wedding Series)"
Customer Reviews For "Princess Ever After (#02 in The Royal Wedding Series)"
This was the book in the series I liked the least. It is hard to cheer for a "hero" who has no spiritual life. Would I want the head of my household to be a man who calls on the Lord only when he wants something no one else can give him? (Is God only our servant ?) I felt sorry for Regina. It sounds like the hero's redeeming feature is his good looks and great kisses. The legalese about the entail etc was generous in quantity and left me bewildered. Books 1 and 3 can stand on their own without this one. I know you're not supposed to judge a book by its cover but this one was just so beautiful! So I read the book and, despite not particularly liking some other books I've read from this author, enjoyed it. It's definitely a fairytale but the characters were so delightful that I found myself reading on just to find out what they'd get up to next. Good fun to read, if you don't mind a heap of history lessons amidst the action. Although set in modern times, the story line of this could really only be a fairytale. It is the story of an American woman who is 29 years old when she finds out that she is the lost princess of a tiny European nation, which will just be absorbed into Europe if she doesn't return and take up her position. It has romance, intrigue and some unreal things happen. It didn't really grab me but if you want to escape for an afternoon into a world of fantasy and romance the characters are likable and well depicted. This is the story to read if you feel everything is just getting a little much, and you'd like to escape into a fictional world where everyone lives happily ever after. Having said that, it's probably wise not to think too much about the story, as I suspect there are quite a few unanswered questions (like, why does the girl from Florida never complain about the frigid North Sea weather, and how discreet is it to fly on Royal Air Force One?). There were also a few unfortunate typos which will hopefully have been corrected in the final editon. But I enjoyed it, once I'd worked out the details of the fantasy kingdom, and would recommend Princess Ever After to anyone looking for a little light relief (and perhaps a prince to love). Princess Ever After is the sequel to Once Upon a Prince (about King Nathaniel), but can be read as a standalone novel. Thanks to Zondervan and Litfuse PR for providing a free ebook for review.